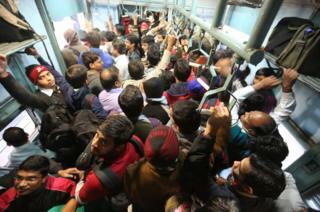 The daily commute to work, squashed into an overcrowded train, is an experience shared by people across the world. 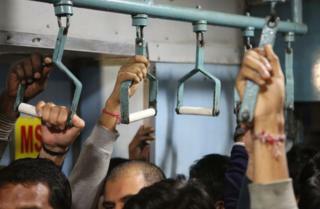 India's railways carry 23 million passengers every day - many of them to and from work. 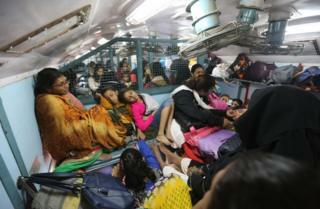 Bhasker Solanki photographed commuters on an early morning train from Surat in Gujarat to Mumbai. 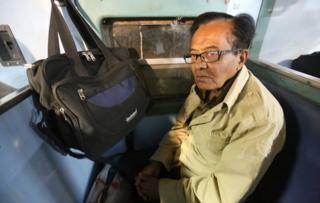 Jayanti Gandhi has been commuting on the same route for 35 years - his 300km (185-mile) journey between Surat and Mumbai takes five hours each way. "It costs too much to stay overnight in Mumbai," he says. "I work in the photographic business and have to go to Mumbai three times a week. This whole train could be filled with just the season ticket holders. "Before, a lot of the same guys used to travel on this route but now they are all new people. When it was a normal train, this train arrived in Mumbai at 10am, then it became a fast train and then a superfast train but it still gets in at 10am." When the train sets off it's easy to find a place to sit. But once the rush starts, it's almost impossible to move and passengers are lucky if they can grab something to hold. The doors close and the next station is 40 minutes away. Every space is used - including the toilet where these men stand for their two-hour journey. Rahul, sitting on the left, wakes up at 04:00 every morning - he has a 25-minute walk to Navsari station where he catches a train to Vapi, 65km (40 miles) away. Then there's a 28km (17-mile) shared rickshaw ride and another 15-minute walk before he arrives at the college where he lectures at 08:30 - four-and-a-half hours after he got up. His classes finish at 14:30, leaving him time to get back to the station for the 16:30 train home. When he gets in, he usually cooks and gets ready for the next day. Although his journey is far from quick or luxurious, it's better than the alternative - in the past he used to catch the bus which meant waking up at 02:30. In first class, Ashok Rao (bottom left) manages to perch on a ledge. 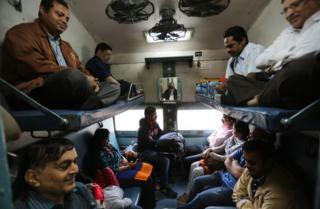 "We haven't got escalators at the railway stations and they won't improve the conditions on the trains but somebody has a bright idea of starting a bullet train costing billions of rupees on the same route which already has a lot of trains," he says. 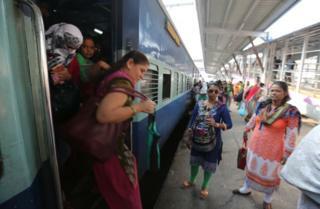 A common feature on Indian trains is the ladies' coach, where women can travel without fear of attracting unwelcome male attention and being harassed. 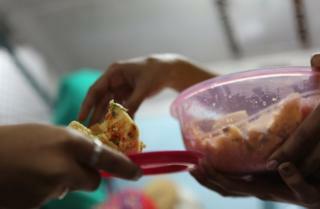 Mansi works in Mumbai and goes back to her family at weekends. 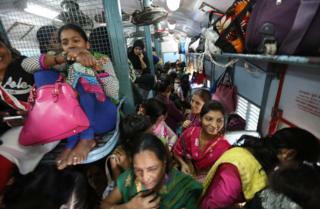 "In the ladies only compartment there are barely 60 or 70 seats but more than 150 of us have to squash in," she says. "We help each other and we don't have to worry about who is around us. We only meet on the train but we have made friends and some of the older women have even found brides for their relatives." Pallavi (in green) designs jewellery. "I sit with somebody in front of me for a couple of hours, which is not good for my back as I get to the office and spend another eight hours behind the desk before starting the journey back home," she says. "It's my birthday today and I have brought some dhoklas [savoury snacks] to share on the train." 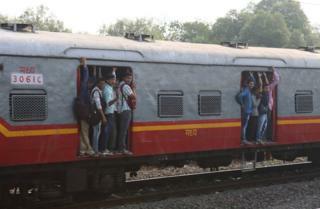 As we reach the outskirts of Mumbai, I can see people hanging on to the outside of the local trains. At the final stop, fellow passengers remind me to watch out for the gap - they've heard people have fallen on to the tracks and been killed. On the Delhi metro, on the coach reserved for women, the ladies unabashedly share their experiences with their friends - and occasionally with strangers. Here are some snapshots of conversations overheard by Shalu Yadav. Illustrated by cartoonist Priya Kuriyan.